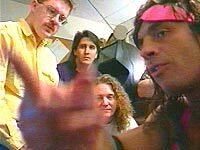 Classic Induction: WrestleMania Video Game Video - Featuring Bret Hart, Video Game Technician - WrestleCrap - The Very Worst of Pro Wrestling! The initial release of the Sony Playstation saw a lot of great games hit in a very short period of time. There were originals like Twisted Metal and Warhawk, excellent ports like Rayman, and arcade classics like Ridge Racer and Tekken. Shortly after the PSOne’s debut, Midway released a conversion of its Mortal Kombat style wrestling game, Wrestlemania. 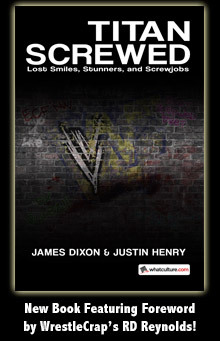 To coincide with the game’s release, the WWF released hints and codes on various tapes, and even commissioned a video to walk players through the game’s secret moves. And it is easily one of the funniest (unintentionally, that is) tapes the company has ever released. As was the norm at the time, the show was hosted by WrestleCrapper Todd Pettengill. He was actually superimposed over game play footage, as were WWF Superstars like Razor Ramon, who would tell you, the fan at home, how to perform their special moves. Sound funny? You betcha! Especially when you have guys with over the top gimmicks like Paul Bearer telling you what button combinations to hit to perform moves. Or the Undertaker, who explains how to play in what may be the funniest soundbyte of his entire career. Note to Kane this weekend: BEWARE THE DEMON DIZZY! But it was Bret Hart who is by far the star of the show, as the Hitman takes part in one of the hokiest skits you will ever lay eyes on. …and working in the metal shop, all while wearing his RING ATTIRE. He did, however, wear a tie to work. Anyway, Bret learned everything he could about the gaming industry, eventually learning so much that he was pointing out programming errors to the creators of Mortal Kombat. …but also playing the keyboards as well as one of the founding members of Asia. So there you have it. Now that Bret’s in-ring career is over, I would look for him to be programming Mario Wrestling, coming soon to a Wii near you. 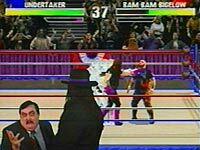 24 Responses to "Classic Induction: WrestleMania Video Game Video – Featuring Bret Hart, Video Game Technician"
I love this video, mainly because it involves two of my brother’s favorite wrestlers (Bret Hart and The Undertaker); and I love making fun of that fact. Is this on YouTube? I have a feeling it’s one of R.D.’s favorite inductees ever, and I need to see it! I used to love this game when I was a kid, and I still play it from time to time. Darn, thought I had caught all those. Fixed now to MP3s. Your iPods will love it! Can’t we ban this impersonation douche already? Midway, which is now Netherrealm Studios, never ceases to amaze me! Um Netherrealm studios is a separate entity from their former masters i.e. Midway. I miss the captions of the audio portions. I remember them being hysterical on this entry. Oh yeah! Hey R.D- put those back, will ya? I hated this game. If I wanted to play Mortal Kombat, I’d just play Mortal Kombat, not a watered-down clone. I could only beat it with Bam Bam Bigelow. Therefor, I hated it. Its no wonder Undertaker’s one of the most legendary faces of wrestling if he can deliver frigging gaming tips without once breaking face or sounding any less fearsome. 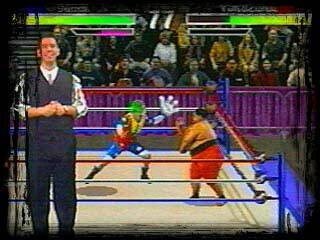 What would win – a Wrestlecrap Video Game Theme Day or a Todd Pettengill Theme Day? Let’s go with video games since Pettingzoo seems too unrealistic to be an actual human being. This game wasn’t half bad. i still own both my sega genesis and this game for it. 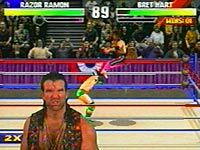 Razor Ramon 20 hit combo ftw! I do recall one arcade machine of this game out in Brazil a whole while ago at an old mall which ended up closing for some reason. It was just a brief look, ‘course, but it looked very unique… specially paired up with many King of Fighters machines and a sole Tekken Tag Tournament machine. Funny that NetherRealm Studios, a kinda-offspring of Midway would also do one WWE game later on. If you liked Bret’s work in this video, you should hear him lead the tutorial in another Acclaim Wrestling Game: Showdown: Legends of Wrestling. I liked WWF Wrestlemania. I still have my copy of it for the Sega Genesis. I also have In Your House for the PS One, which is not as good but it was the last video game appearance of the Ultimate Warrior until coincidentally, Showdown: Legends of Wrestling. “Dereferencing a null pointer” cracks me up every time, because it IS actually a thing that would very easily cause a bug! Granted, they probably just asked the programmers to give Bret some jargon to say, but it’s cool to see that they actually went that far! Speaking of crap Acclaim games, how about inducting all three Legends of Wrestling games? They were either devoid of content or buggy, or both.